As I'm writing this post, my tooth (the very one which cracked on an errant popcorn kernel last year) is throbbing with a ferocious determination- as though it's only wish is to make every bone on the left side of my face suffer along with it (so spiteful, these chewing contraptions!). I used to think that a migraine was the worst form of torment a body could inflict upon itself, now I'm convinced that tooth pain should bear that cantankerous crown. Adding insult to injury- it was my Beloved lemon who procured this intolerable pain- although I'd like to look at it from an uncharacteristically optimistic point of view and think that it was lemon's way of telling me the dentist didn't properly patch things up last time. A bit of tough love, lemon, but thank you all the same. Living in my faerie tale world of baking, where nothing bad can ever possibly happen in the form of a pastry, I probably should have stopped after the first lemon bar. I did not. 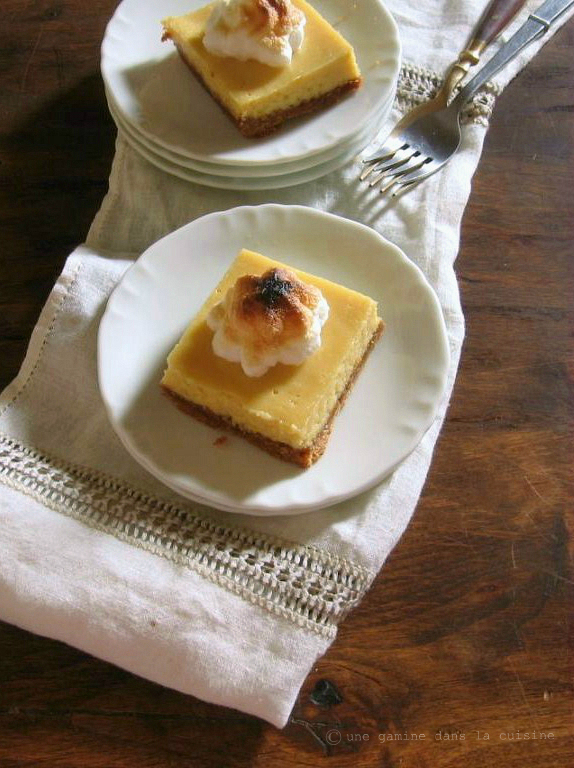 These lemon meringue bars are scrumptious enough to eat- even if they come at a painful price an hour or so later. 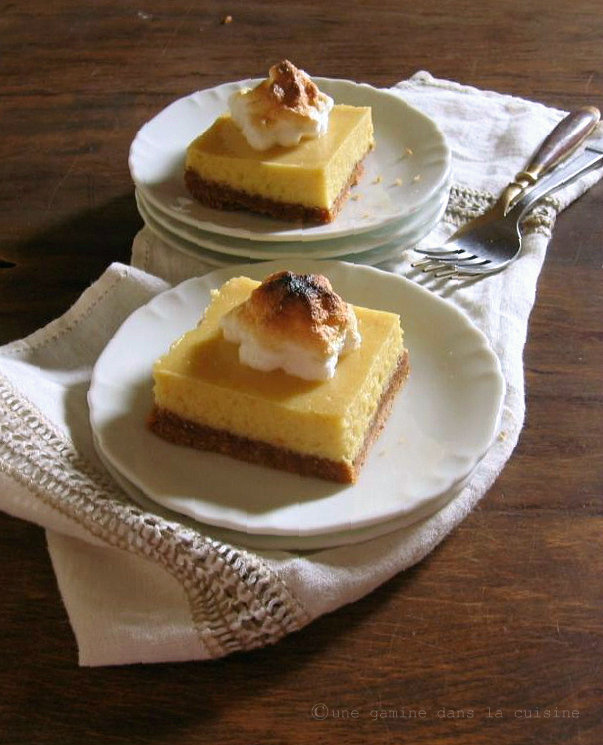 This recipe is a citrus-y, amicable union of Key lime pie and lemon meringue. The crust is traditional, yet flawless with it's sandy graham cracker texture and buttery notes. The filling is a combination of lemon juice *ouch* and sweet milk- or as I like to call it, milk of the gods. 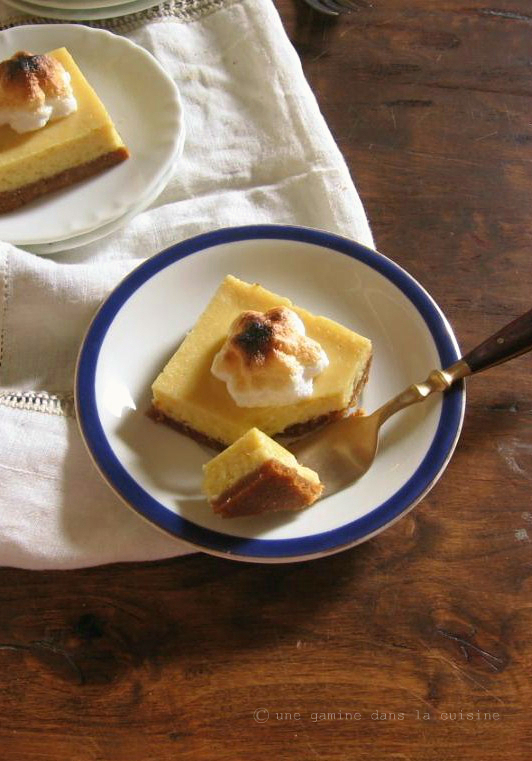 It's a sweetly tart filling that satisfies even my love for all things lemony. *wince* The meringue topping is optional. I'm not a fan of meringue, but I wanted an excuse to play around with my oven's broiler- even though I visit often, the broiler and I are still strangers. I'm quite happy with the meringue, it added some fluff to the lemon bars and didn't compete too much with the filling. If you have ever craved a dessert that was a mix of two classic pies- in bar form- this is your recipe. Feel free to switch things around and use limes or oranges. I think oranges would give these bars a little bit of a creamsicle vibe! Preheat the oven to 350 F. Line a 9x9-inch pan with foil and butter the foil. Prepare the crust: In a medium mixing bowl, combine the graham cracker crumbs, melted butter, sugar, and ginger. Use a fork to blend everything together until you're left with a wet, sandy mixture. Use the bottom of a measuring cup to press the crust into an even layer on the bottom of prepared pan. Bake until lightly golden- about 8 minutes. Remove the pan from the oven and allow the crust to cool completely before adding the filling. Prepare the filling: In a large mixing bowl, whisk together the cream, lemon zest, lemon juice, sweet milk, and eggs. Make sure everything is well combined. Pour the filling over the cooled crust. Create a bain-marie: Place the baking pan inside a larger baking pan and pour enough hot water into the larger pan to come halfway up the sides of the smaller pan. Remove both pans from the oven and remove the lemon bar pan from the hot water. Set the pan onto a cooling rack and cool to room temperature before placing them in the refrigerator for at least 3 hours. Prepare the meringue: In the bowl of a stand mixer fitted with the whisk attachment, beat the room temperature egg whites until light and frothy. Slowly add the sugar in a steady stream. Beat everything together on med-high speed until glossy and peaks hold their shape when the whisk is lifted from the meringue. Use a spoon (or a piping bag fitted with a large tip) to dollop the meringue onto the cooled bars. If desired, use a blow torch to toast the meringue, or place them onto a cookie sheet and hold them under the oven's broiler for a few seconds. Hell hath no fury like a pain in the tooth, so sorry! But on the brighter side, the light in your photos is exquisite! Ouch!! I'm sorry about that pain :( I HATE toothaches. They are horrible. I love lemony desserts, and this lovely bar looks incredible! And those photos...me oh my... I love them!! I have that cookbook! I have never actually made anything from it, per se. I get inspired by things and now I know I should have made these, ages ago. They're gorgeous, Valerie. And sorry to hear about your tooth....ouch!! When you take away my ability to speak, you know you've made an amazing recipe. I don't even know what to say, except I must try these. These looks so pretty, love the meringue topping! I adore these bars, especially the meringue topping! Hope your tooth is feeling better, I hear ice cream or a milkshake can be quite the cure ;). I've a freezer full of cups of lemon juice - usually for my three layer lemon pie, but these sound lovely. Oh you poor thing! Hope your tooth gets better soon. I hurt my jaw on an extra chewy peanut butter ball last weekend so kind of know where you're coming from - some food is too tasty to resist! These bars look beautiful. I love meringue so might add a little more - definitely planning to make! What's not to love about this dessert? These look seriously yummy! I mean I have been having a serious lemon merigue jones lately. Gorgeous! When life gives you lemons, definitely create these scrumptious bars! They look divine! Hope your tooth is feeling better, Val! I have just made refined sugar-free lemon meringue tarts on my blog and I love them just as much as the traditional ones. I actually like the meringue on the top because of the contrast between the tart of the lemon and sweetness of the meringue. It's a great combination. I hope your tooth calms down so you can resume eating these. A combination of lemon meringue and key lime in bar form? Yes, please! Hope your tooth is better! I am so intrigued by all of the meringue pie goods. These look wonderful! These look incredible! I hope you get that tooth properly dealt with soon, OUCH. hope you feel better soon! tooth pain is the worst! these look wonderful - and i'm kinda (okay, completely) wishing i had these in lemon form as well as the orange and lime you suggested. it has been dreary here and i could use some delicious citrus treats as a pick me up! you know I do not have a torch. this makes me so sad as I would love to make my own smores and meringue. Ouch, tooth pain is the worst. Hopefully the dentist can get it fixed so you can truly enjoy these wonderful bars. I wish I had one this morning. Ouch! I hope your tooth is on the mend. That's so painful. These bars look extraordinary. Beautiful! Awesome job, as always! You are so right! Ouch! Did the bars help? They look fabulous and I hope they took some of the pain away! Delicious! Definitely trying out the recipe. I have a bone to pick with you! Why do you make such beautiful desserts that make me want to abandon my diet ASAP! I should really look away now, because you just got me so hungry...! Just made this last night - very yummy! I don't understand what the purpose of the foil is - all it did was make the finished product less presentable (ugly), and we had to worry about eating bits of foil that scraped off with the crust when we served it. Next time I'm skipping the foil unless there's a good reason. Is there one? @Jen, sorry about the foil issue...it's supposed to prevent the crust from sticking to the pan. If you make the recipe again, maybe try using parchment paper instead (still butter it up nicely!). I haven't been able to afford a dentist for way too long and have a tooth that keeps abscessing every few months. ugh! I use alpha lipoic acid capsules which are a miracle worker for tooth problems! I take at least 600 mg a day and the problem goes away within 2-3 days. It really works great for any kind of nerve pain. You can easily find them at any grocery store or retail store that sells vitamins and supplements. Hope that helps you! Can't wait to try these bars! Have you tried it with oranges yet? Would they be too sweet without a little lemon added to the mixture? @Dianna, Thanks for the tips!